My daughter has always wanted to add or change something to the decor in her bedroom. And believe me – it has been a nightmare until I found this list with 17 fun DIY cheap ways to decorate a teenage girl’s bedroom… which I will share with you. Your teenage girl’s bedroom decor will quickly go from blah and boring to funny and amusing! One thing I can ensure you – these simple bedroom decorating ideas for teenage girls are easy to make and can be customized to fit her taste and personality! The simple wooden box shelves are a great wall decor for teenage girl bedroom. They bring chic and different touch to the whole room and the wooden goes with all kind of materials and colors. These type of shelves would perfectly fit above the desk. Similar ideas to this one you can find here. Talking about teenage girl bedroom decorating ideas, this IKEA DIY no-sewing bench brings a whole new world to the kid’s bedroom. It’s very easy to be personalized and makes the atmosphere cozier. When you’re collecting ideas how to decorate a bedroom for teenage girls, keep in mind that the wire wall grid is a perfect choice for the ones who prefer the simple, minimalistic decor. It can be used to display photos or leave important sticky notes. 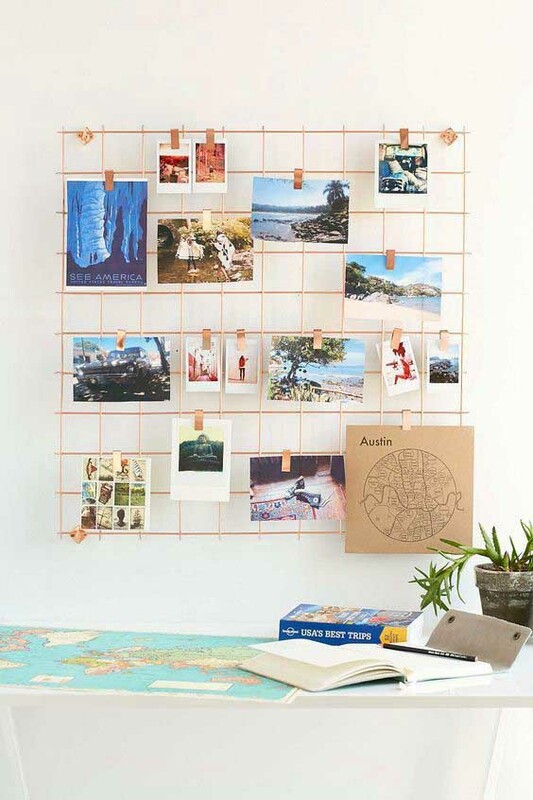 As there are not many colors, the wire wall grid can easily go with pretty much everything. As a hint – why don’t you add a desk or a little IKEA table next to it? 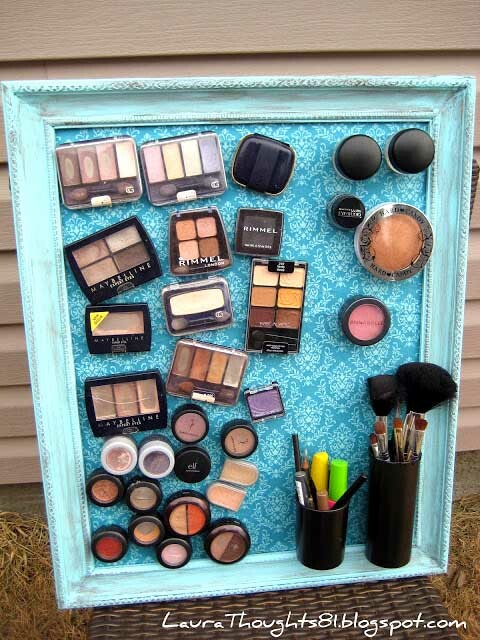 The DIY make-up magnet board is maybe one of the most suitable bedroom decor ideas for teenage girls. In one hand, it looks cool and artsy, from the other hand – it helps to keep all the make-up in order. You can use an old picture frame and customize it in an appropriate color. Here is how. All the teenage girls are usually very foppish so if you are wondering how to decorate a bedroom for a teenage girl, just remember – a big mirror in the middle of the room cannot be a wrong choice! As a hint, add some kind of old-looking frame that will bring an extra vintage chic to the whole decor. A detailed tutorial and similar ideas, you can find here. The lighting is always crucial no matter if we are talking about living room furnishing or decor for teenage girl bedroom. 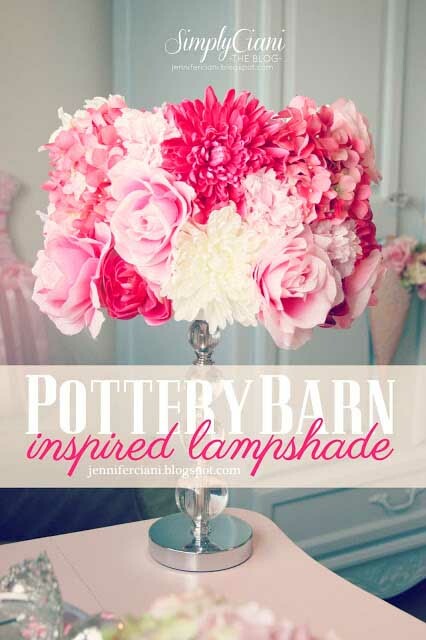 Here is something girly and stylish from me – flowers lampshade. 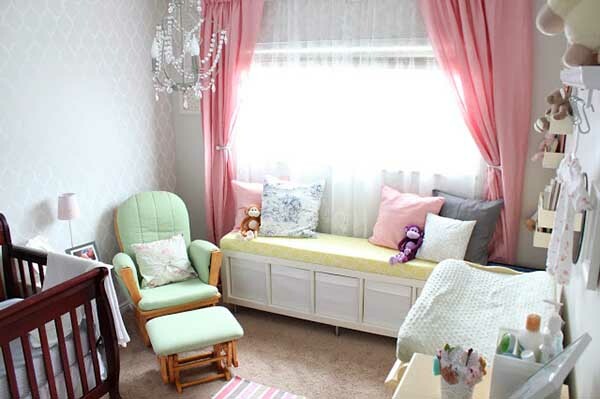 The full tutorial how to bring the early spring into your daughter’s bedroom, you can find here. Every teenage girl loves fairy tales and wants to be the princess saved by the beautiful prince. 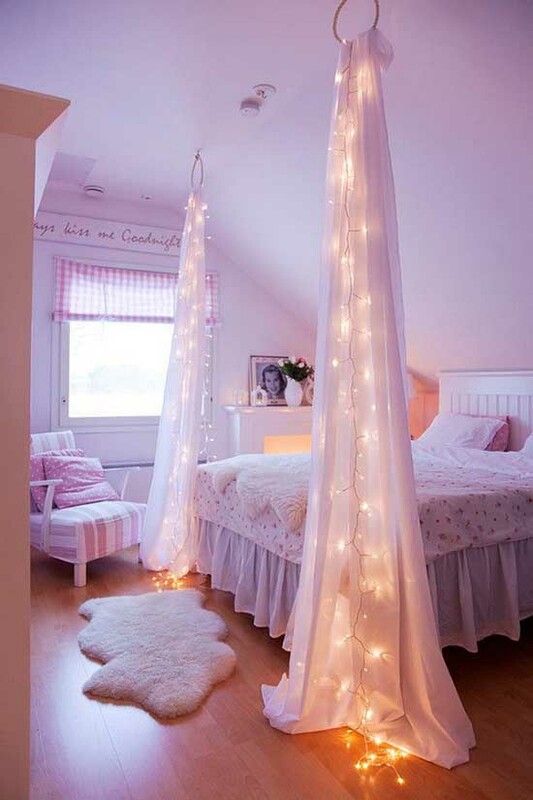 The starry night string lights are one of the most magical decorating ideas for teenage girl bedroom. However, it may seem difficult for amateur DIYer, trust me it’s not! To help you get started, I’m giving you the detailed tutorial. 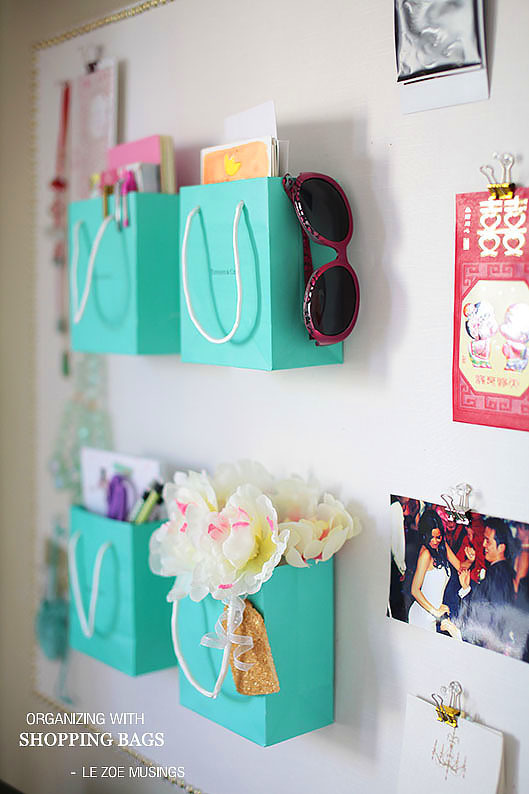 You can easily make Tiffany’s shopping bags organizers for decorating teenage girl bedroom. It’s not just that they are eco-friendly but they are also very stylish and girly in the simplest way possible! 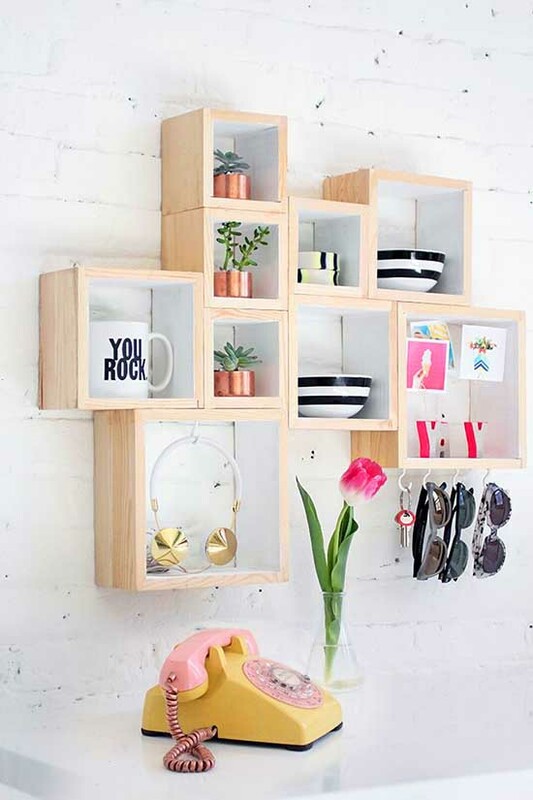 These cool organizers can go to the wall above the office space or above the bed. You will find the detailed tutorial here. 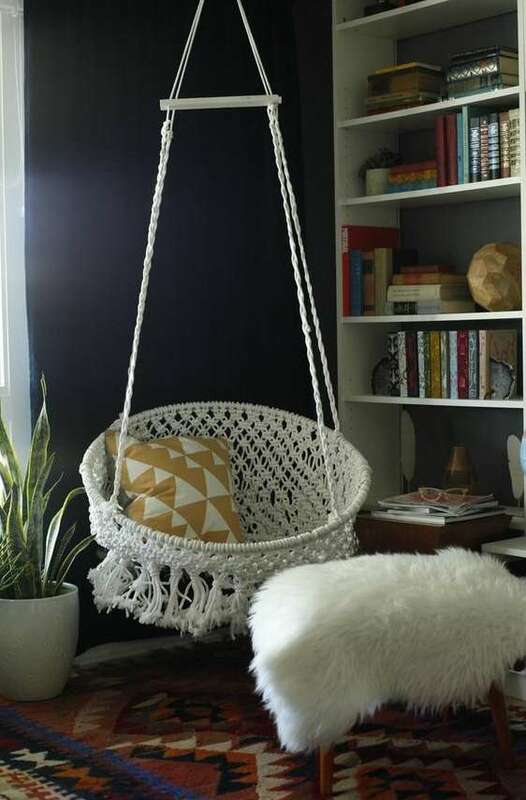 If you are searching for teenage girl bedroom decorations, consider this DIY hanging macramé chair – it’s pure boho chic on a budget! Everything you need is 1700 feet of clothesline, scrap wood, an old chair frame, and a hula hoop. This tutorial will guide you how to build it on your own. 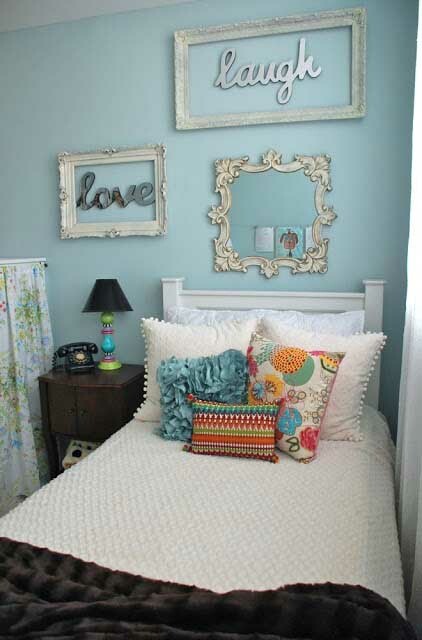 Painting the walls in turquoise is one of the most popular ideas for teenage girl bedroom decorating. This vibrant color has a calming effect on the mind and body. Plus, it’s super chic! In case you have already chosen another color for the bedroom walls, you can add some accessories in turquoise as a final touch. More ideas HERE. 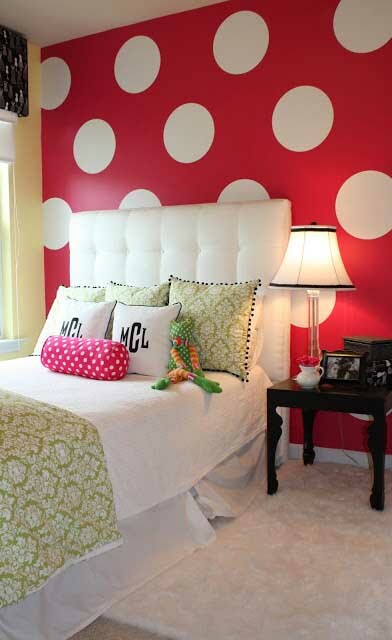 Polka dots are a suitable bedroom decor for teenage girls. It brings retro atmosphere. They don’t necessarily need to be in white and red tone, you can customize them as per your daughter’s taste. Here is an easy step-by-step tutorial. 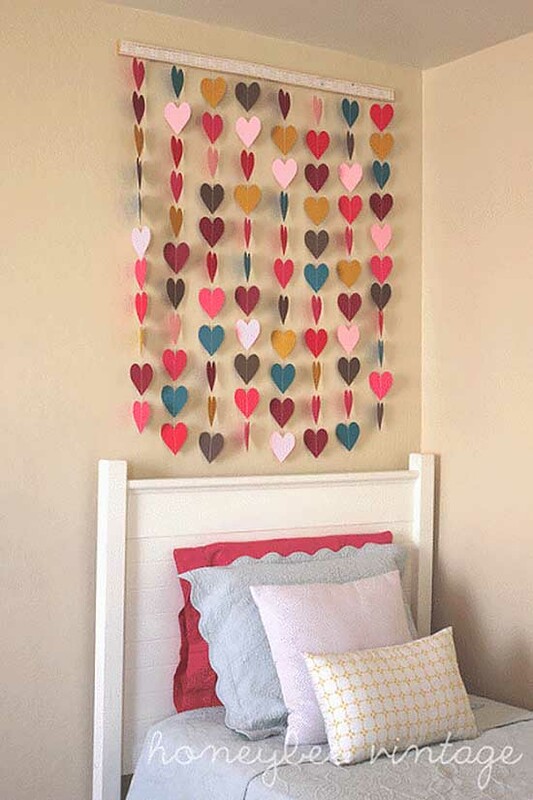 To all crafty people: stop wondering how to decorate teenage girl’s bedroom – the paper heart wall could be your answer! You can play with the hearts’ size and colors. But the best part is that you can have a little bonding moment with your teen daughter as you can work as a team while crafting the wall art. More similar ideas can be found here. One of the most important teenage girl bedroom decorating tips I can give you is to look for simplicity. You don’t necessarily need to give tons of money for expensive accessories. For instance, the vintage frames above the bed would be a great wall decoration. You can find them on some flea markets and garage sales. Here is some more chic inspiration here. 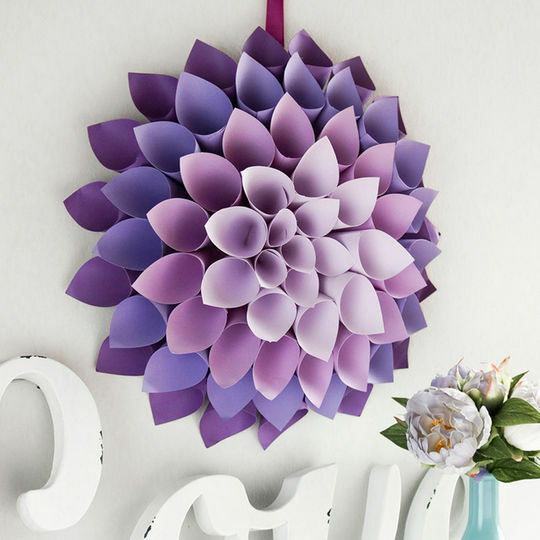 This is something for master DIYers – Dahlia paper wreath. You are free to play with the colors considering the whole bedroom decoration. Combining flowers and lights is one of the trendiest (and cheapest!) decorating ideas for teenage girl bedrooms. 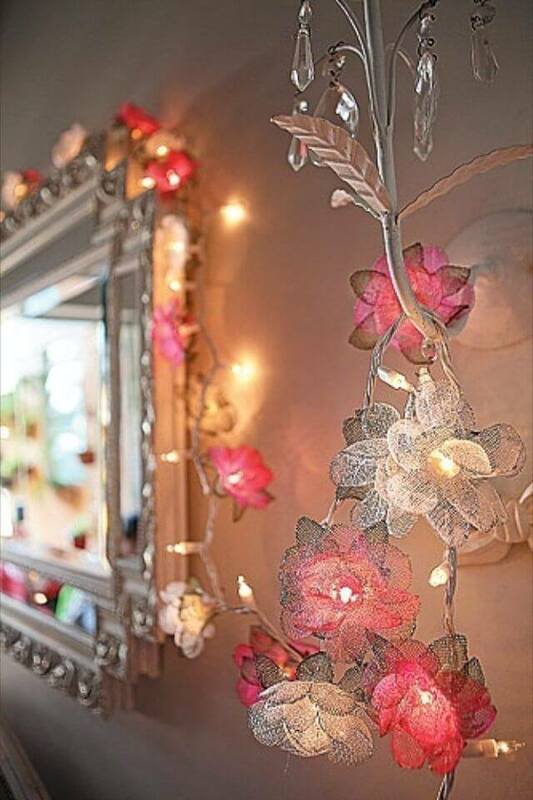 All you need to do is attaching some artificial flowers around a mere wired lighting. Play with your imagination, be YOU! Some more similar ideas – here. The macaroon plush pillows are something every young girl is dreaming about! 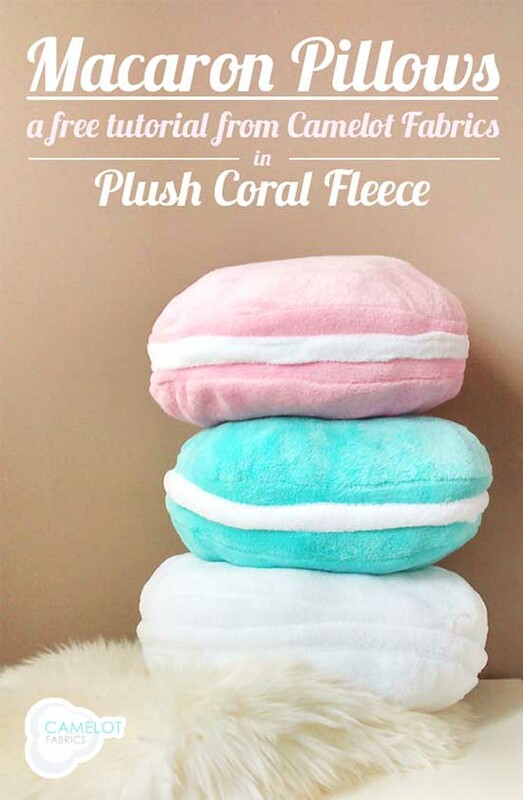 They are soft, cute, come in different colors and sizes and are a great touch to the décor for teenage girl bedroom. Do it yourself step by step. 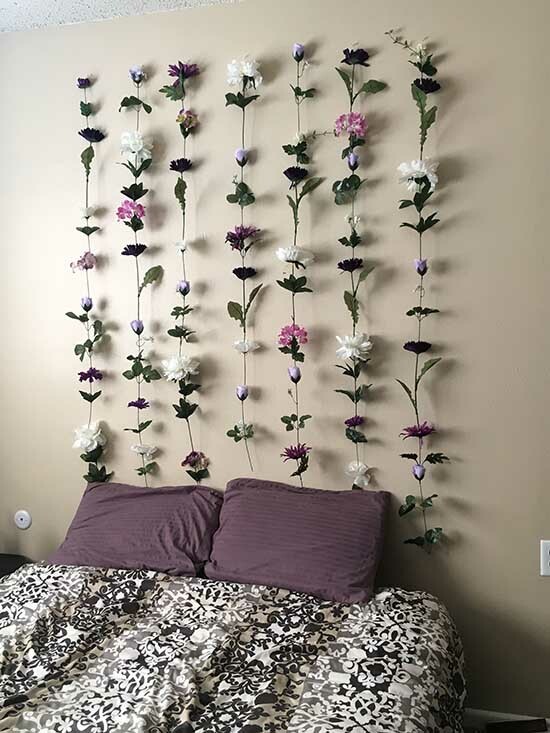 Here is a very quick and super easy tutorial on how to make a flower wall using just a bunch of fake flowers, hot glue, a few nails and a bit of fishing line. Great for a headboard! If you are stuck between tons of DIY ideas how to decorate a bedroom for a teenage girl, consider the built-in storage as an efficient use of space. 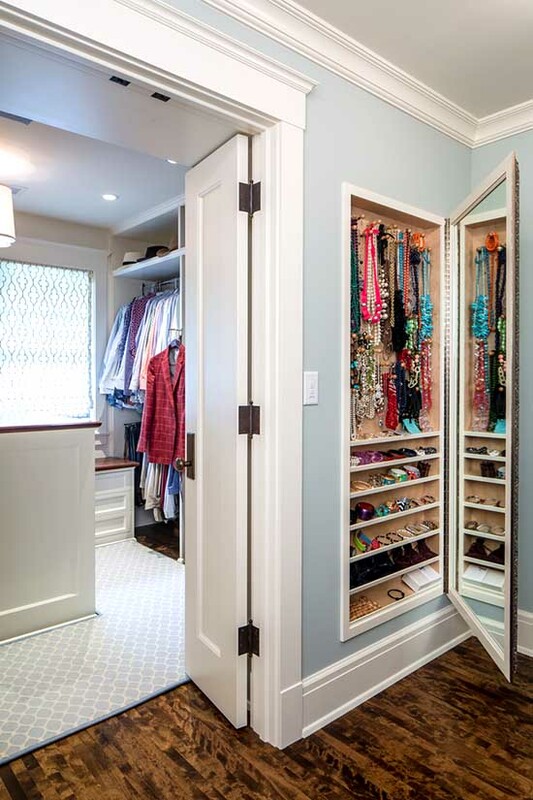 Girls usually have much more stuff than the boys so this “hidden” storage will make the bedroom looks tidier. This idea is particularly good for small spaces. If you liked these ideas, please SHARE with the buttons below. You can find more great ideas in our Recommendation section below!